Sadly our AMAZING Sue Williams will be leaving us in late July to move into a very well earnt retirement. 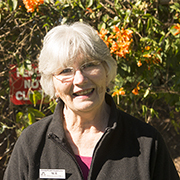 Sue has worked closely alongside both Manager, Staff & Volunteers for the past 6 years. Although she started as a volunteer, we quickly realised her skills and potential and brought her on board with our Administration team. Sue has always been 100% professional and reliable, helping to positively shape the Centre into what it is today. Sue will be dearly missed by all. Sue has started up her own business in eco-dying. She runs a successful Etsy store, as well as the occasional market stall. Follow Sue on Instagram @suewi648 and find her on Etsy (www.Etsy.com.au) under NaturallyDyedbySue. On behalf of the Manager and Staff, we would like to thank you Sue for a wonderful and dedicated 6 years. You have been a heart of our Centre, keeping our Staff happy, and with your beautiful persona always shining through. We wish you the very best.